The leaves are changing color, there’s a chill in the air, and some stores already have Christmas merchandise on shelves. Fall is basically here, even if it doesn’t officially start until Sept. 23. So what’s the status of iCloud and iOS 5, both of which are also slated to arrive in autumn, according to Apple at WWDC 2011? The official answer is that they’re in beta, in developer testing ahead of their wide release, but that’s not really an answer that provides much information regarding when they’ll actually arrive. The answer to that question, like the betas themselves, are actually very complicated, which is why it might be quite a while yet before we see them become publicly available. Apple just released a new beta build of Mac OS X Lion 10.7.2, which introduces iCloud integration to the desktop operating system. By all accounts, the updates are big steps forward toward a stable public release. They finally package the iCloud apps right into the update, whereas before you needed a separate installer, according to Business Insider’s Ellis Hamburger. It’s not a feature update, but rather a bug-killing build that’s specifically aimed at testing iCloud features. It’s a good sign that on the OS X side, Apple is making solid progress toward a stable Golden Master (GM) candidate release. It makes sense that Apple would have the least trouble with OS X, since iCloud is the only thing that’s changing about the desktop operating system. The latest version of iOS 5 is beta 7, released Aug. 31. Even though the beta is covered under an Apple non-disclosure agreement with developers, reports have been trickling out that indicate there are still plenty of issues to address, including very high battery drain for some users. Bugs and outstanding issues indicate that there should probably be at least one or even two more developer builds before we see a stable GM candidate. That would make iOS 5 a good candidate for the most beta releases of any iOS build to date. The longest before now was iOS 2, which saw eight betas over four months. IOS 3 and iOS 4 had five and four betas each over four and five months, respectively. IOS 5 beta 7 marks the fourth month since the first preview was released, and based on the stability of said build, we’ll probably see at least another month before it’s ready for everyone. It makes sense that iOS 5 would require a longer development cycle than most, because it’s a more ambitious release than we’ve seen. Not only does it bring big changes to the way the operating system works and the features it offers (notifications, iMessage, a whole new app with Reminders, etc. ), but it also introduces iCloud, which will be a persistent, always-on syncing solution both for Apple’s content and for apps from developers, too. Trying to make sure all of that new stuff works smoothly is a big challenge for a single major point release. Bottom line, expect iOS 5 (and probably iCloud, too) to arrive later rather than sooner. If mid to late October release dates are accurate for the iPhone 5, that’s about when I’d anticipate iOS 5, too, based on these developer statements. A new report this morning from one analyst says Apple is scheduled to ship the GM version to its iPhone manufacturing partners at the end of September, which is also in keeping with an October release. 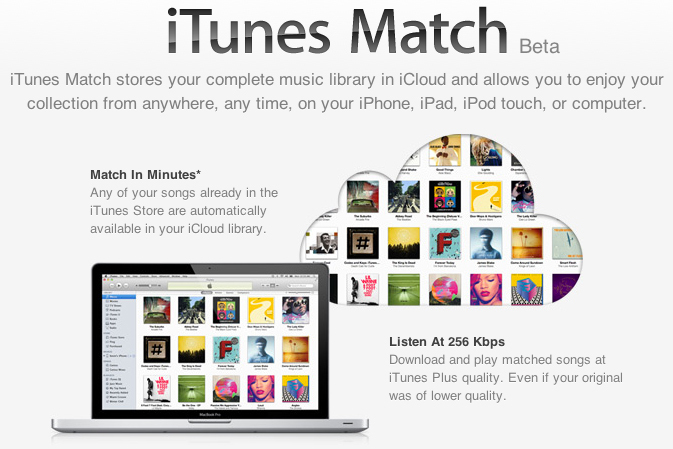 Apple’s new cloud music solution, iTunes Match, only just entered beta with Apple reaching out to developers to subscribe early on Aug. 29. The beta quickly closed to new sign-ups, but then opened again on Saturday, Sept. 10 for a new round of developer registrations. The service scans your local iTunes library, identifies matched tracks from Apple’s servers, and makes those available for download to any Mac or iOS device associated with your account. It also uploads tracks it can’t find, so you can redownload your entire library from anywhere even if some of it isn’t available in Apple’s catalog. Since the beta only recently opened, and appears to be only slowly expanding its range, it’s clear that the Match service is still a ways off from a public release. It might still make the iOS 5 launch, but I doubt that Apple will rush things and instead could introduce the service at a later date after iOS 5 and iCloud get up and running. They better be fixing the Active Directory bug if they want people to buy Macs in that environment. That’s a massive pain in the rear. We’re buying about 10 Macs (laptop, iMacs and Mac Pros) and they won’t work on our network until that issue is solved. Luckily, reports from developers say that the AD bug is indeed fixed.